Every tooth in your mouth has “pulp”, which is located in “canals” within each tooth root. Pulp consists of connective tissue, nerves and blood vessels. It nourishes the tooth when it first erupts, meaning emerges through the gum. Once the tooth matures, the pulp can be removed safely from the pulp chamber and root canals, and the tooth can be maintained. This is because the tooth is also nourished by the blood supply that surrounds the tooth. Removing the pulp is called endodontic treatment, but is often referred to as root canal treatment, root canal therapy or “having a root canal”. Root canal therapy is quite common. The procedure saves an estimated 24 million teeth each year in the United States. the teeth do not respond to antibiotic treatment. The inflammation caused by the infection restricts the tooth’s blood supply, so that the antibiotics in the bloodstream cannot reach the infection very well. The reduced blood supply also limits the pulp’s ability to heal itself. 2. Damage from trauma, a fracture or extensive restorative work, such as several fillings placed over a period of time. Sometimes a common dental procedure can cause the pulp to become inflamed, and may lead to the need for root canal therapy. This is generally due to an imperfect nerve. In many cases, when the pulp is inflamed, but not infected, it will heal and return to normal. Dr. Smith and Dr. Mandava will monitor the tooth before recommending root canal treatment. Once the pulp becomes infected, the infection can affect the bone around the tooth, causing an abscess to form. The goal of root canal treatment is to save the tooth by removing the infected or damaged pulp, treating any infection, and filling the empty canals with an inert material. If an infected or injured tooth that needs root canal treatment is ignored, you may not only lose the tooth, but the infection may spread to other parts of your body. teeth can drift out of line and can be overstressed. Keeping your natural teeth also helps to avoid more extensive treatments, such as implants or bridges. When Do You Need Root Canal Therapy? A tooth that hurts significantly when you bite down on it, touch it or push on it. To determine whether your tooth needs root canal therapy, the doctor will place hot and /or cold substances against the tooth, gently tap on the tooth and feel the surrounding area. He will also take x-rays. pain or shock; it gives you a tingling cold or warm sensation that stops immediately when the tester is removes from the tooth. tooth will need several appointments to make sure that the infection is eliminated. Some teeth may be more difficult to treat because of their position or because they have many and/or curved canals or for other reasons. Once the root canal treatment is finished, you will need to have the tooth restored with a crown or filling. You will not experience any pain during the root canal procedure. First, we will numb the area around your teeth. The doctor will then make a small hole in the top of back of your tooth to get to the pulp chamber and remove some of the diseased pulp. The root canals have to be measured, so that the doctor knows how long they are and to make sure all the diseased tissue is removed and the entire canal is cleaned. locator makes a calculation based on the resistance to a small electric current. This gives the doctor an accurate measurement of the root canal. After the root canals have been measured, the doctor will remove all of the diseased pulp. The cleaned out canals are then cleaned with an antiseptic solution, which helps to treat the source of the infection. For the root canal therapy to be effective, ALL the canals within the tooth must be cleaned. Generally, the top front teeth have one canal, the bottom front teeth one or two canals, the premolars one or two, and the molars three or four canals. The location shape of these canals can vary significantly. Once the root canals have been thoroughly cleaned and the doctor has made sure that the infection has been removed, he will place a special material into the canal where the pulp once was. A temporary filling is then placed to cover the special root filling. time, ideally within a month of the root canal therapy. It is important to permanently restore the tooth to prevent damage to it later, i.e. cracking or breakage. The pulp that was removed during your root canal treatment is the part that responds to temperature. The tissues and nerves surrounding your tooth remain, so your teeth will still respond to pressure and touch. Your tooth may be sore for 2-3 days after the procedure, and we recommend that you avoid chewing on the affected side. 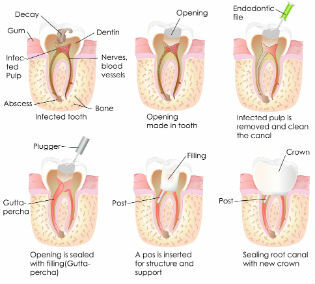 The worse the infection and inflammation was prior to root canal treatment, the sorer the tooth will be after treatment. You may take over-the-counter pain relievers to ease any discomfort.